What are your thoughts on the January digital edition of National Right to Life News? We held off on the monthly digital edition of the “pro-life newspaper of record” so as to get as much information about the upcoming session of Congress as we could and the March for Life. This year the Rally and March takes place January 18 in Washington, DC and begins on the National Mall, between Madison Drive and Jefferson Drive. Based on the usual feedback, I am pleased to anticipate that many readers will consume a goodly share of the issue (in this case, it’s a whopping 48 pages) and are sending stories along to pro-life life family and friends. What will you see in the January issue? As always we tried to use the edition commemorating the anniversary of Roe v. Wade to dig into the history of this judicial abomination and to outline what pro-lifers at the state and federal levels are attempting to rein in the 1973 decision. One page one Jennifer Popik, NRLC federal legislative director, and Ingrid Duran, NRLC state legislative director, summarize what took place legislatively in 2018 and the impact of the November mid-terms. On page seven Karen Cross, NRLC’s Political Director, provides a very handy overview of some of the new pro-life members elected to the U.S. House and Senate. In one of the editorials which begin on page two, we talk in depth about the upcoming 46th anniversary of Roe v. Wade and Doe v. Bolton. And since this entire issue is a commemoration of Roe and Doe, NRL News is offering multiple stories on the cataclysmic impact of decisions that had no foundation in the Constitution. Please also read the stories on pages 27-28, and 34 & 36. NRLC President Carol Tobias addresses “2019: challenges and opportunities” on page three. Carol explains how returning Speaker of the House Nancy Pelosi is up to her old pro-abortion tricks and how you can help NRLC to advance “Operation 2K20: Building a Pro-Life America (see page four). 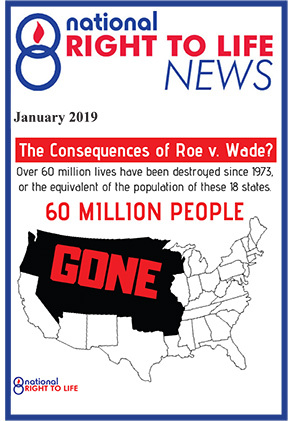 On page six, Dr. Randall K. O’Bannon, NRLC’s director of Education & Research, has compiled a one-page summary of the latest abortion numbers and trends. 60, 942, 033 unborn babies have lost their lives since 1973, but the yearly number has finally been reduced to under well under a million. That is an absolutely unacceptable number—any abortions are unacceptable. However we should never lose sight of the fact that pro-life education has decreased the loss of life by almost 700,000 from its high point of 1,608,600 in 1990! On pages 18 and 35, a breast surgeon and several academicians give readers scholarly evidence demonstrating abortion’s devastating after-effects on women. Without shortchanging the complexities, they write in layman’s terms. Thank you all you are doing on behalf of the little ones and the medically vulnerable elderly. And if you are not receiving our Monday through Saturday NRL News Today in your inbox, please sign up immediately here.